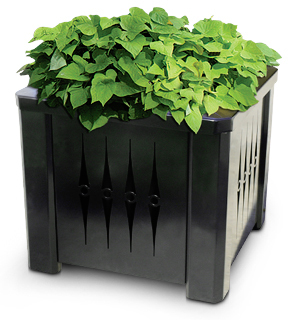 This all steel commercial grade square planter features creative laser cutout circles and accents that make it extremely visually appealing and unique. Powder-coated black for durability. Pairs up beautifully with matching powder-coated steel trash receptacle. Black plastic liner made from 100% recycled plastic is included. 1/8" thick plastic liner included.